When we met in the early '80s, Marta had just divorced. Married for over 20 dismal years, she was then required to pay her ex-husband alimony while he tried to become employable. She had never received nor bought a piece of good jewelery other than her wedding ring, and she wasn't wearing that anymore. 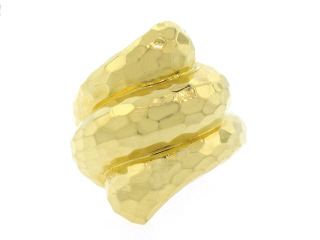 I love gold rings, especially when high-karat yellow gold acquires patina. Fifty-something women can wear them with presence. Below, a selection of substantial gold rings, pleasing choices for any jewelry collection. All have weight, quality and grace: the gold standard. 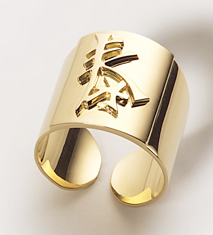 Ann Gérard "Sagesse" ring, with Chinese ideogram for wisdom, €1250 from Ann Gérard. Henry Dunay Facets 18k hammered gold ring, price, $1,750, from Beladora; one of a selection of stunning Dunay pieces. Tiffany Paloma Picasso Marrakesh ring, price, $1,050. Decorative yet not intrusive, this quiet beauty is also made in gold and enamel for those who must have colour. Links of London "Hope" 18k ring: a graceful sweep, large enough for a cocktail ring but not too massive for day. Price, $1,650. A.G. Correa's 18k hand-braided Turk's head ring is a New England classic; the motif has been used on wooden ships for millenia. 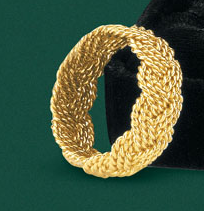 Shown, the three-strand style; price, $1,100. Aware that some women prefer a finer ring, I want to show you this delicate yet substantial Lucie Heskett-Brem 20k Waterballet band. 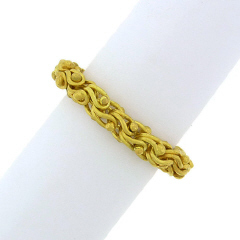 The gold is worked into long thin strands, then handmade into loops and twists to make a graceful chain ring. From Aaron Faber, price, $995. 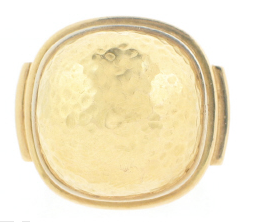 A Victorian gold buckle ring symbolizes love and friendship. This floral-motif ring is an especially beautiful example from 1st Dibs seller Primavera Gallery. Size 8.5, 18k gold; excellent condition. Price, $2,100. 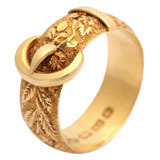 Whether you choose new or vintatge, gold rings need minimal care. Just remove yours if you are working with materials (cleaning products, paints or solvents) that could discolour the gold, or when using a tool like a wrench that could bend softer high-carat pieces. I don't like to see gold rings re-polished, as some jewelers offer to do. Let the patina come; the ring, like us, has earned it. these are gorgeous, Duchesse, and I love the story you weave into the post. Completely agree with you on the patina, which we absolutely have earned. P. and I have just come back from the gorgeous new flagship Bompard store and couldn't help but think of you there -- you're a def. inspiration, and my Mastercard thanks you! 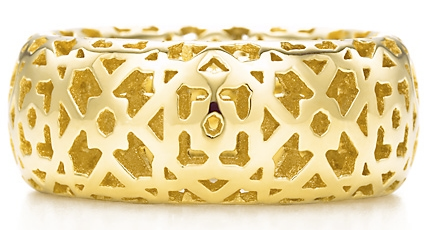 Love, love, love the Marrakesh ring! Before we married, my husband and I went ring shopping. At a Manhattan antique shop I tried on a ring of beautiful lemony gold that suited me as no piece of jewelry had before or since. Made in Thailand, it had tiny diamond brilliants caught in a band of hand-wrought filigree; it looked as though it had been made by fairies. But the price was $800, my husband had just graduated from medical school, and he said, "Impossible," so off we went to the Diamond District for a plain 14k gold band. It was a sensible choice, yet for years I felt that I was wearing someone else's ring. When my knuckle enlarged too much to wear it comfortably, I put it away without regret. I've never seen another like that Thai ring, and maybe it would not seem as perfect as it did 25 years ago, but your post has nudged me to keep my eyes open for a gold ring that might feel just right for me as I am now. Thanks. materfamilias: Yes! Eager to hear what you chose. Kristine: I can't stand the logo'd stuff, but every now and then Tiffany transcend their current tackiness. C.: Thai filigree is very beautiful and extremely fragile. If it's any comfort, am willing to bet the ring would not have stood up to daily wear. It would make a beautiful cocktail ring, though. Hope you find a new wedding ring that's "you". Thanks for this post! My husband recently bought me a gold ring for my birthday, and it has been sitting in the box because it just doesn't feel right. (I'm not gasping with joy when I look at it.) Most of the rings you posted gave me that feeling. So I think that means that the birthday ring goes back. I hate to do that, but I'd rather not have a piece that I don't want to wear! Wow. I love the Dunay piece. I used to love rings, but since recovering from tendonitis in both hands and forearms, I can't wear them any more. I enjoyed your story of Marta. Did she remarry? Wonderful. You may remember that in the year after my divorce, my mother and stepfather gave me a gold ring from Fibula, chased with vines and set with very small diamonds. I wear it every day. Thanks for what I think I can call an affirmation, even though that's not a very WASPy thing to say:). spacegeek: I agree, better returned than sitting in a box. Susan T: She did not remarry and as far as I am aware, did not date. This is not her wish, just the way it happened. LPC: I do remember that, such a loving gift. Thank you for telling the story here and for encouraging other women to make a gesture toward a new life. At some period after I became widowed, I replaced my wedding ring with a big gold ring. Like your friend and LPC, the big gold ring was the anti wedding ring. Thank you as always for linking to Beladora. My husband has two wedding bands, because he lost the first, bought another, then found the first. I've started to wear the original on my right hand, middle finger. Can I just tell you - men's rings are COMFORTABLE! Isn't it funny that comfort is a selling point for men's rings, but is never mentioned for women's? Belle: I am a huge believer in the symbolic and talismanic power of jewelry. Have also replaced wedding rings (twice). It's a big, emotional step. rb: "Comfort" equates, when marketing to women to "dowdy" or "aging"- therefore avoided. Yet a ring worn everyday must be that. Lovely to wear his ring! I've also seen them worn on a chain as a necklace. Love, love, love that Sagesse ring! They're all fabulous but that one really speaks to me, though outside of my price range right now. Those are some lovely rings! I especially love the "Waterballet" style -- I like to stack my rings, and it would play nicely with one I bought myself at Christmas. I had a similar ring to the Turk's Head, but in silver, for ages. I wonder if it's still banging about in the jewelry box. Pseu: next time you are in Pris you might enjoy a visit to her studio. Lovely person to deal with. Rubiatonta: Sometimes you can rediscover jewelry you've forgotten about and realize revived pleasure.